Medical corpsmen of the US 71st Infantry Division, 3rd US Army look on as captured German soldiers remove bodies from inside a barracks in Gunskirchen. 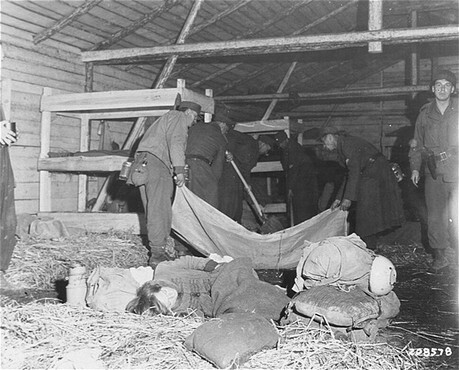 In the foreground, a Jewish girl lies huddled in the straw on the floor of the barracks. Gunskirchen, Austria, May 7, 1945.